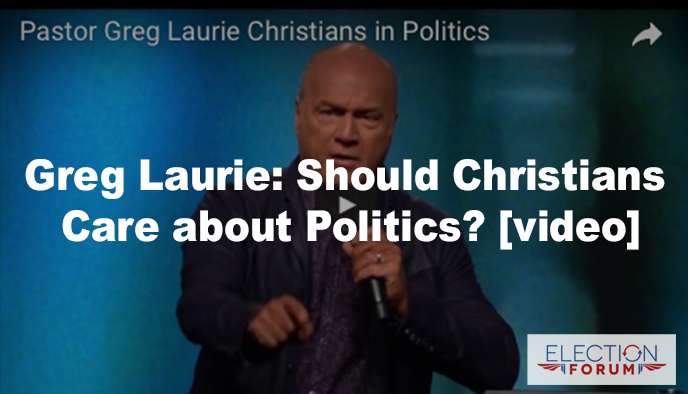 Here is a powerful 3-minute video with Greg Laurie of Harvest on Christians and politics. About 3 minutes. I am so encouraged with what Greg Laurie shared here. To know that there are many Christians in our new administration brought me great comfort. And to know they all meet for bible study is just wonderful. It all seems so hopeless at times with all this garbage going on around us, but God is in control and He is the one who writes the final pages of this book. If He is for us, who can be against us? I, also am encouraged, Cathy, with what Pastor Greg Laurie said. The one impediment to talking from the pulpit about candidates and politics was the Johnson Amendment, which then Congressman Lyndon Johnson inserted into a needed law. Now that Pres. Trump is going to have Congress get rid of this Johnson Amendment, Pastors can start talking “politics” and what is right for the country. Our Pastor never talked about voting or any candidates, for fear of losing tax-exempt status from the IRS. Thank You Lord and President Trump!